Hatters boss Nathan Jones isn’t surprised to see Cambridge United starting to turn the corner under caretaker manager Joe Dunne. The former Gillingham and Colchester defender has taken over at the Abbey after Shaun Derry’s two and a half year reign was ended last month, winning his first three games in charge. I’ve been to watch them twice live and they’re playing for Joe as well, so he’s done a wonderful job. Although the U’s went down 1-0 at Accrington Stanley on Saturday, they still harbour slim ambitions of making the play-offs, nine points adrift of the top seven with 11 games to go. 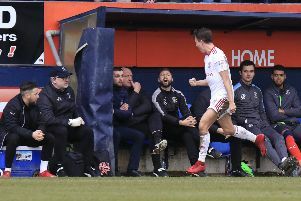 On Dunne’s impact, Jones said: “Joe’s an experienced coach, a very hard worker, I know Joe very well, I see him at a lot of games, so I know his work ethic. “He has paid his dues and done his apprenticeship. He was manager of Colchester for a while, and would have learned from that experience no doubt. “He is a learner and it’s no surprise that he’s done well. He’s obviously galvanised them, they are a decent side, have got some good players, are a good club. “Joe’s got them organised, you can see that. I’ve been to watch them twice live and they’re playing for Joe as well, so he’s done a wonderful job. “They’ve picked up lately as even Shaun over the Christmas period, they had a real good run of form, but we prefer to play those. “Since Shaun left, they’ve won three, lost one and they were very unfortunate to lose at Accrington because I wasn’t convinced that goal should have stood. Town defender Scott Cuthbert thought that the change of leadership at Cambridge proved what a secure place Kenilworth Road is these days, with Jones now the 25th longest serving manager in the top four divisions of English football. He said: “If there’s a transfer in this league or a managerial transfer in this league, you’re always going to talk about it. “We’re really fortunate enough to have a bit of stability, the manager’s been here two years now, so we know ourselves at this club that we’ve got stability. Meanwhile, if the game at Cambridge does go ahead, with a pitch inspection planned for this afternoon, Jones doesn’t think United will be any more dangerous to face with Dunne potentially looking to get the top job on a permanent basis. He added: “I don’t think there can be any more motivation. You can add another 10 reasons, when Luton play anyone, the motivation to win is sky high anyway. “We saw with Cheltenham last week, teams change for us at times and that’s what they did. “I think Cambridge are motivated to win a game against Luton and they will be, regardless of if Joe wants the job, if they’ve got a new owner. “I don’t think they can have any more motivation than they do already have and it’s going to be a tough game, we know that.